Think dressers are just for storing clothes? Think again! 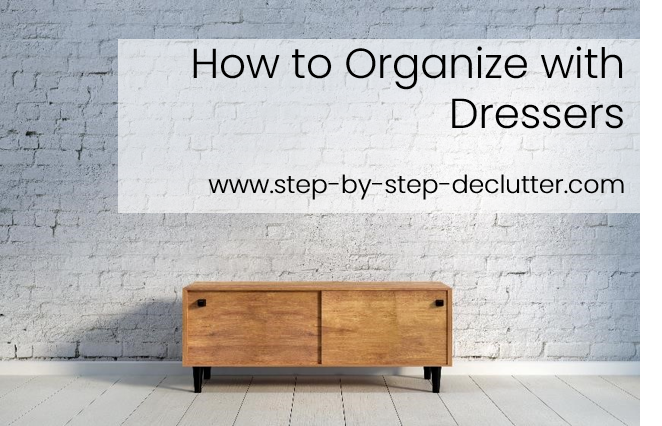 There are a million and one ways that you can organize with dressers. OK. That may be a slight exaggeration, but they really are multipurpose organizational gems! Dressers come in a wide variety of shapes and styles to compliment any décor. What’s more, if you can’t find one you like that fits your budget or your space you can always repurpose a thrift store find. The beauty of dresser storage is that it’s hidden, out of sight, not visible to the general public. Dressers allow you to corral your clutter in a stylish, discreet fashion. What’s more, they offer display space on top for the stuff you want people to see, the stuff that gives your home style and personality. The spacious drawers of a dresser are great for storing everything from board games to bedding to bakeware – yes, bakeware. Dressers are an excellent storage option for an entryway. Use the drawers to store gloves, hats, scarves, sunglasses, purses and wallets, ID badges, and other necessities out of sight. Use the top to create a welcoming display that sets the tone for visitors entering your home. This no-frills dresser has a family-friendly vibe. Removing some of the drawers and replacing them with wicker baskets adds character and interest to an otherwise dull dresser. This beautiful blue dresser, combined with the elements displayed on and above it, adds drama and sophistication (as well as storage) to the space. Here's a really innovative use of a dresser in an entryway. A section of drawers were removed in order to nestle a cozy bench seat into the frame of this charming old dresser. Open shelves take the place of the remainder of the drawers offering ample, attractive space for storage or display. In the dining room dressers offer storage for table linens, napkin rings, candles/candle holders, silverware, serving pieces, or whatever else may be need. In addition, the tops can be used as a staging or serving area. The simple lines of this dresser turned buffet make it perfect for either a modern or a rustic décor. Leaving the door off to expose the shelves provides display space for pretty serving pieces. One option if you're a wine lover is to transform the empty space where a couple of drawers once resided into a spacious wine rack. Sometimes no transformation is needed. An already attractive dresser adds tons of dining room storage and serving space as is. In the living room dressers make great storage for board games, DVDs, music, video games and controllers and other electronic equipment. You can even stash some extra blankets in them for snuggling under on a cold night. Whether you lean toward traditional, modern, rustic, or an eclectic blend of various styles, when it comes to organizing with dressers, there is literally something for everyone. If you don't like an old piece you've got hanging around, you can always transform it with a coat of paint and some updated hardware. A dresser makes an excellent media storage cabinet. Video games/accessories, DVDs, and all sorts of other unsightly electronic equipment can be stealthily stored out of sight, leaving an attractive surface for displaying the things you want people to see. Who says dressers have to be placed against the wall? Here's a great example of a dresser turned sofa table. With the top two drawers removed it now provides both open and closed storage, and the burlap covered shelves add a layer of visual interest. At first it may seem counter-intuitive to talk about dressers in the kitchen, but they make an interesting, storage-packed alternative to a traditional kitchen island, among other things. Here is a great example of a dresser transformed into kitchen storage. This piece could function as an island or be tucked against a wall. Add baskets for storing kitchen linens, utensils, and so forth. Who doesn't need more drawers in their kitchen? I know I do! A dresser can provide tons of added drawer space and be finished to coordinate with the existing kitchen. When removing dresser drawers to create open storage, look for ways to reuse them and get double the storage from a single dresser. Try hanging them on the wall as shelves, stacking them to create bookshelves or putting castors on them and stashing them under a bed. While dressers may seem like a natural in a child's room, there are some unique ways in which they can be incorporated to provide additional storage beyond mere clothing. Here is a simple yet ingenious way to add book storage to a child's bedroom - attach IKEA spice racks to the sides of an old dresser. This solution could work in the rooms of older children as well; the spice racks could be utilized for storing anything from nail polish and perfumes to action figures and trophies. Add some legs to a deep dresser drawer to create storage for books or toys. This is another option that could easily transition as a child ages and serve multiple functions. Use dressers in the home office for storing office supplies both inside and on top. In addition to storing a variety of office supplies, this dresser has been outfitted to store a printer out of sight. The front of one of the drawers has been redesigned to drop down allowing easy access to the device. Here is another example of a dresser with a drop down drawer. The hidden compartment makes a great place to use a laptop and then store it out of sight when not in use. Connect two small dressers with a custom or premade desktop and you have an functional desk with lots of storage. The example here utilizes two IKEA Malm dressers. Re-purposing an old dresser can be a great way to add style and storage to a bathroom for not a lot of money. If you've got the floor space, a dresser can provide ample storage for extra towels, toilet paper and other bathroom essentials. Dressers can be transformed into bathroom vanities by cutting a hole or holes in the top to accommodate a sink basin and adjusting the drawers to fit around plumbing. You can find a dresser to compliment pretty much any style of bathroom. 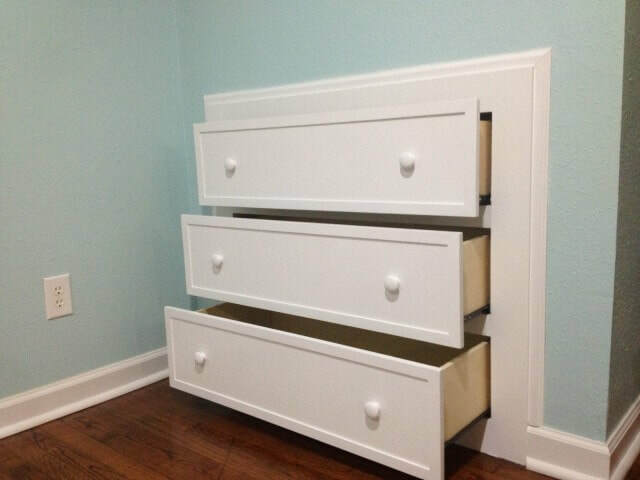 In some cases it may be possible to build a dresser right into the wall thus adding storage space and preserving floor space at the same time.